In Japan, as in many other parts of Asia, noodle cuisine occupies a very important place in both the traditional and modern diets. The three most popular varieties of noodles are Ramen, a relatively recent adaptation of a Chinese noodle dish, Soba, made from buckwheat and wheat flour, and Udon, made from wheat flour. Udon’s root in Japan may be traced back over 1,000 years to the early 9th century, when Kobo Daishi, one of the Japan's most revered scholars and Buddhist priests (who was born in Sanuki, Kagawa Prefecture), brought the method of making wheat-based noodles back from Tang-dynasty China. Udon noodles are white and relatively thick (4mm-6mm), and are made by a special method of kneading purpose-grown wheat flour, salt and water. 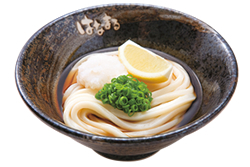 Udon can be served in many ways-either in a hot soup in winter or cold style in summer. Cold Udon is eaten by dipping the noodles into a thin sauce, called mentsuyu. In recent years, the media spotlight has focused on Udon cuisine, particularly because of its nutritional qualities in an increasingly health conscious marketplace. The noodles themselves have almost no fat, trans-fat-free and are an excellent source of carbohydrates, while the accompanying soup or thin sauce and condiments offer an array of subtle flavors and healthy ingredients. These may include, among others, wakame seaweed, vegetable tempura and scallion. Men, women and children of all ages in Japan regularly enjoy Udon dishes, especially those that reflect the particular season, both at home and at specialty restaurants.